Edge Zones presents Zones Art Fair, a unique fair with a performance centric mission. Special programming after art fair hours happening daily, please check event calendar. Wild Embeddings and Diverse Universe are pleased to announce PerforMIA: SATurday, which is part of Zones Art Fair during this year's Miami Art Week. The event will combine free performance art along with artwork for sale by artists from Estonia, Nicaragua, Colombia, New York, Oklahoma, Florida, and more. The Performance Art Series in and around the gallery will showcase live work that analyzes topics of contemporary concern alongside remarkable moments in history. The non-live art will be set up in three trucks parked in the back lot, called On The Run Underground Art Show. The exhibition will consist of printmaking, photography, painting, sculpture and installation. PerforMIA: SATurday will be held at Edge Zones, a non-profit space near Wynwood, founded and run by artist, Charo Oquet. Agrofemme (NYC/Virginia) makes "drawings, photography, video, objects, and interventions through text and ritual, embodied in live performance. The texts, which inform my current work, are culled from obscure and esoteric writings and history of the 19th century French and English avant garde, 18th through 20th century occult texts, contemporary post-humanist theorists, and radical queer/feminist theory," from Artist Site: http://www.agrofemme.com. Carol Monteleagre (Colombia/Miami) is an "Anthropologist, dancer and performance artist. Investigates the embodiment in contemporary society and its relation with time and existence. Her work addresses various issues related to being in time and space, how we are affected by our social, political and natural environment, and how, as we transform it simultaneously, constantly with every single action," from Artist Site: https://vimeo.com/carolmontealegre. Sergio Mora (Florida) "I have always used art to communicate the depth of emotion that grips the human experience, exposing hidden truths beneath the surface of our day-to-day interactions - a poet first and foremost who evolved into a Performance Artist in order to challenge myself artistically and work within and against physical and mental limitations," from Artist Site: http://www.sergiormora.com. 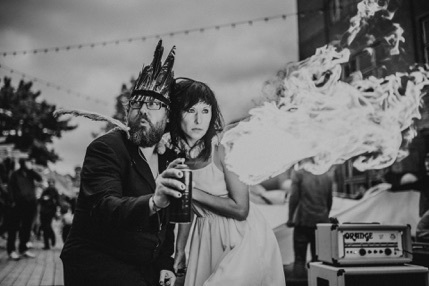 Michael Wilson (Oklahoma) is a printmaker, performance artist, educator, and founder of Crazytooth Press. "I like the desert quite a lot, and rocks are important to me. Oklahoma doesn’t have rocks, the dirt is too old," from Artist Site: http://crazytoothpress.com. Fatherless (Illinois/London) is "the result of 5 individual artists working cohesively with each other’s artwork. Described as a visual mix-tape of shenagination, we combine our cultural influences in ways that finished works are not only unique to our collaboration, but unique among the editions of hand-screened prints as well; we make certain no two prints are ever the same," from Artist Site: www.wearefatherless.com.